Millennium is our cornerstone fawn Accoyo stud out of El Nino's Accoyo Michelangelo and NorthCoast Accoyo Arabica Gold. 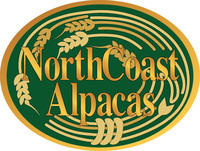 This has been a powerhouse combination for NorthCoast Alpacas and Millennium is the third full brother produced from this mating. 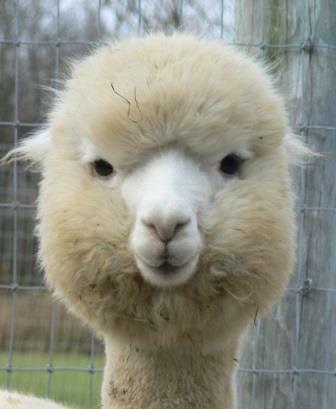 His fleece is extremely dense, uniform and fine as would be expected from a Michelangelo son and a top quality dam. Ahwahnee was purchased from Pet enters during their close-out sale and we have been extremely pleased with her production. 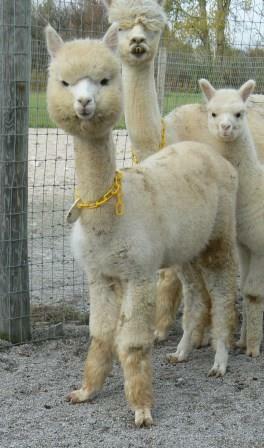 Her latest cria, Accoyo Aiyana, is outstanding and we are looking forward to her next addition to our program. Aiyana is a full Accoyo Michelangelo grand-daughter. On the maternal side of the pedigree the grand-sire is Accoyo Tsunami, a B-line stud chosen by Don Julio Barreda for fineness and taken off the top of the 6Peruvian import by the importers (Pet Centers) as a prime breeding stud for their Accoyo program. Her great grand-fathers include well known studs: Dracula, Brutus and El Nino. The bloodlines are outstanding as is this young female who will be ready to breed in 2014. She is still young enough to show prior to breeding. We will include a no cost breeding service (drive-by) or will provide a free breeding with board charged during breeding. 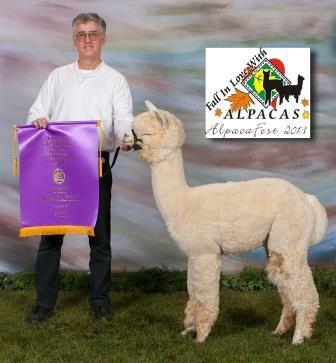 This is a beautiful young female and is ready to carry on the Accoyo tradition in your breeding program.